Last week we announced Richard Dean Anderson would be returning for a brief cameo in the new series Stargate Universe, and we're happy to announce another Gater popping by... but where is McKay? Amanda Tapping will make a guest appearance on SGU, as she should since the Syfy Channel is practically where this lady lives, plus she's great. Also in the mix are Michael Shanks and Gary Jones... but while some people want to know where Christopher Judge (Teal'c) is, I'm really more concerned with David Hewlett. Last we heard he was making an appearance as Agent Moore in The Closer. Which is fantastic and we completely support it... but when is he going to be on Stargate? I need a David Blue/Hewlett banter back-and-forth showdown. Not that I've seen any of this allegedly hilarious Blue footage, but if Robert Carlyle says he's delightful, then I'll believe him... for now. Our longstanding love for Hewlett springs from the fact that he's consistently funny, and charming. 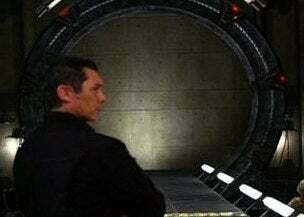 Maybe it's the writers, maybe it's him or a combination of both, but I'm not sure I can jump onto this dark Stargate wagon with out SOME assurance that McKay will show up somewhere.